The Doro HS 1910 wireless headset uses DECT technology to provide a long range and a high quality sound. The flexible Doro HS 1910 wireless headset is designed to work with a number of different types of phones boasting the ability to connect to both cordless and static phones alike. 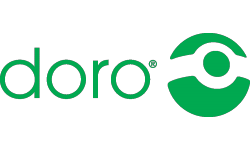 The Doro HS 1910 can be used with most GAP compatible DECT cordless phones with the Doro headset pairing to the DECT cordless phone as an additional handset. Thanks to its line interface, the Doro HS 1910 wireless headset can also be connected to most corded desk phones by plugging into the phones handset port or headset port. You can even use the Doro HS 1910 headset in a location where there are no phones as the HS 1910 headset’s base unit can alternatively be plugged directly into a telephone socket, however the headset can only be used to answer calls when used in this way. Utilising DECT technology, the Doro HS 1910 wireless headset offers a 50 meter indoor range and up to a 150 meter outdoor range. From a full charge you will get up to 7 hours of talk time and a 100 hour standby time. The Doro HS 1910 is fitted with an automatic charging mechanism that prevents the battery from ever overcharging and the related damage to the headset this may cause. The modern and stylish HS 1910 headset offers its wearer three different wearing styles. You can wear the headset over the head with the supplied headband or over the ear or behind the neck with the supplied ear loop and neck band. All three wearing attachments are easy to clip on and remove. The headband can be adjusted to be made bigger or smaller to ensure a personalised fit and the headset can also be adjusted to allow it to be worn on either the left or right ear. With a noise cancelling microphone, the Doro HS 1910 wireless headset is suitable for use in noisy and bustling office environments with the microphone effectively filtering away distracting background noises for a much clearer and natural sound. You are also protected against the damaging effects of sudden loud noises thanks to its in-built acoustic burst protection technology. The Doro HS 1910 headset is very easy to use, with a one button call answer / end function. You also have the ability to mute calls and adjust the call volume. The Doro HS 1910 is available as a package including just the headset and base unit or as a package which includes the headset, base unit and handset lifter. The handset lifter is an optional or add-on accessory which can only be used when the headset is being used in conjunction with a static phone. 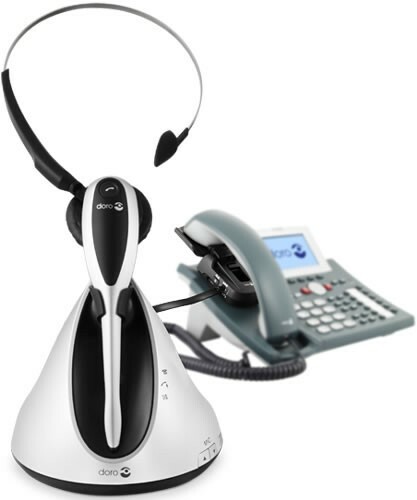 It allows calls to be answered and ended remotely, on the headset, when the wearer is away from their phone.